KLH-conjugated synthetic peptide encompassing a sequence within the center region of human SERCA1. The exact sequence is proprietary. The quality of the peptide was evaluated by reversed - phase HPLC and by mass spectrometry. Blocking Peptide to the dil uted primary antibody in a molar ratio of 10:1 (peptide to antibody) and incubate the mixture at 4 degree C for overnight or at room temperature for 2 hours. Small volumes of ATP2A1 blocking peptide vial(s) may occasionally become entrapped in the seal of the product vial during shipment and storage. If necessary, briefly centrifuge the vial on a tabletop centrifuge to dislodge any liquid in the container`s cap. Certain products may require to ship with dry ice and additional dry ice fee may apply. 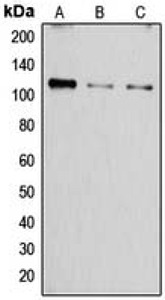 The peptide is used to block Anti - SERCA1 Antibody reactivity. Western blot analysis of SERCA1 expression in A549 (A), mouse muscle (B), rat muscle (C) whole cell lysates. Immunohistochemical analysis of SERCA1 staining in human muscle formalin fixed paraffin embedded tissue section. The section was pre-treated using heat mediated antigen retrieval with sodium citrate buffer (pH 6.0). The section was then incubated with the antibody at room temperature and detected using an HRP conjugated compact polymer system. DAB was used as the chromogen. The section was then counterstained with haematoxylin and mounted with DPX. NCBI/Uniprot data below describe general gene information for ATP2A1. It may not necessarily be applicable to this product. ATP2A1: This magnesium-dependent enzyme catalyzes the hydrolysis of ATP coupled with the translocation of calcium from the cytosol to the sarcoplasmic reticulum lumen. Contributes to calcium sequestration involved in muscular excitation/contraction. Associated with sarcolipin (SLN) and phospholamban (PLN). Increased contractile activity leads to a decrease in SERCA1 expression, while decreased contractile activity leads to an increase in SERCA1 expression. 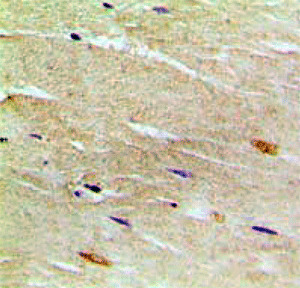 Skeletal muscle, fast twitch muscle (type II) fibers. Reversibly inhibited by phospholamban (PLN) at low calcium concentrations. Dephosphorylated PLN decreases the apparent affinity of the ATPase for calcium. This inhibition is regulated by the phosphorylation of PLN. Belongs to the cation transport ATPase (P-type) (TC 3.A.3) family. Type IIA subfamily. 2 isoforms of the human protein are produced by alternative splicing.